During a particularly deep and meaningful talk about our relationship, I came to the conclusion that relationships are like bean bags. Huh? I hear you think. Well, as I explained to JD, a bean bags takes a certain shape when you first sit down on it. And usually, that shape fits around you perfectly. So no need to move. But after a while of having sat in the bean bag, you start to feel a bit stiff and you think: "I need to stretch my legs, change position, get back to that feeling I had when I first sat down in it and the beans shaped to envelop my body to create a perfect match." So, you get up, grab the bean bag and give it a good shake. If you do it right, the bag will look familiar (it is after all still the same bag) but it will feel like a rejuvenated bean bag and if you are lucky, it will even feel the same and yet new and different. Just repeat the process whenever you feel stiffness and pain and you will enjoy your bean bag for the rest of your life. In extreme cases you might even think:"What a useless piece of junk this bean bag! I anticipated to be sitting in the same position for the rest of my life without pain but now I am feeling stiff and my legs hurt. I am ggoingg to throw it away and buy a new one! Why bother with trying to repair/change it? It is still the same bean bag, no matter how you sit in it and since I am uncomfortable now, there is no way this same bean bag can make me comfortable again." If that is how you feel about your beanbag, then you might indeed want to get a new one and give your old one a retirement. See, just like a relationship: it gets a bit stale sometimes so you either shake it up or ditch it. I personally think regular shake-ups are great. Small shakes, big shakes, which ever suits you best at the time. "KFC is to roll out a 16-piece bargain bucket in the UK to support its global tie-up with the United Nations' World Food Programme." Rrrriight.....A whole 10p from every bucket sold will go to the UN programme. Wow! That will really really help. Not. Serial Killer in the making? Do I feel bad? Nope. Do I feel like a serial killer in the making? Nope. Was I scared? You bet! 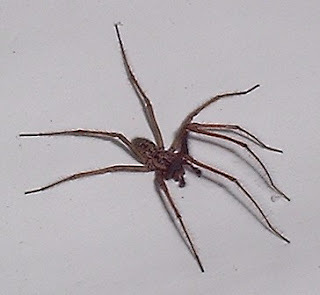 This morning, after JD had left the house: A massive big spider stared at me from the kitchen sink. I yelped, jumped, hyperventilated and then realised I would need to kill the beast. It was him or me. Despite my fears, I managed to capture the animal underneath a glass. But then what? No way in the world I was going to lift it up on a piece of cardboard and throw it out of the window! And so I did the only thing left to me: I went to the cupboard and took out a bottle of bleach. Poured the bleach into the sink whilst lifting the glass ever so slightly. The bleach poured under the glass and I quickly put the glass down again. What followed wasn't pretty. The spider was clearly in distress but my fear of spiders is greater than my compassion for them. And so I watched as the arachnoid struggled with the chlorine fumes and eventually shriveled into a little ball of miserable legs. I left it for another 5 minutes and then poured boiling water in the sink, flushing the spider away. Must make sure he is dead. I always read about serial killers who started when they were kids by out pulling spiders' legs out and enjoying it. Maybe I will be a serial killer when I grow up. But at least the sink was nice and clean! !